Sometimes a few different thought streams randomly cross and you start connecting the dots about problems that you've been viewing from only certain angles in the past. That happened to me last week. Thought Stream #1 had me making a list of the most common objectives I receive from IT organizations as we discuss products, technologies, etc. They aren't unusual, and they'd probably been reasonably consistent for the past 5-6 yrs (or longer). As I had been thinking about item #1, what I found partially humorous and quite telling was if I took the list and changed the points of view. My original list was from the point of view of a IT organization speaking to a technology vendor. The list highlights the vendor's flaws and why the IT organizations probably won't be making an investment with them (or why they want the vendor to change their offering to better meet the IT organizations needs.). But then I also realized that if I looked at this from the perspective of a business unit within the company talking to an IT organization, almost every one of those "issues" were also in play. But instead of "the competition" being another technology vendor, it was now a Service Provider, Cloud Provider (IaaS, PaaS, SaaS) or a "shadow IT" group within the business unit. Hmm...if the problems with how a vendor offers technology to a IT organization have large % overlap with the complaints a business unit has to the IT organization, we might be onto a significant improvement opportunity here...assuming certain groups are willing to make changes. 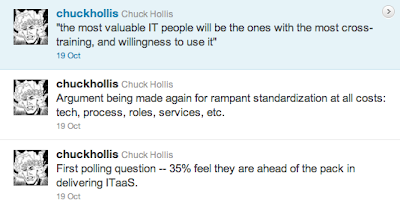 But then you start reading Chuck's tweets (feedback from IT organizations) and you realize some things aren't going to change very easily. People and organizations identified as the bottlenecks to change. But many leaders in this space believe they are "change agents". Those same people and orgs concerned about their jobs, focused on the 47 minutes (a year) difference between three 9s and four 9s, but not clearly able to measure costs or SLA impacts. Those same groups have a 29% approval rating on one of the Top 2-3 metrics ("agility") that the business expects IT to help them solve for the business. Now the connecting of these dots isn't going to prevent vendors and technology consultants from talking about features. It's their security blanket. It validates their intellect. But it's not going to keep moving the needle for the business with outside competition to IT organizations growing. And this isn't going to get IT organizations to start acting like a market-driven organization that benchmarks themselves against outside entities. But it's a prime opportunity for those "change agents" to start backing up their talk at conferences with actions for their businesses. It's a two-way street, but there is a massive opportunity for both technology vendors and IT organizations to have some interesting conversations about how to improve the entire supply-chain from technology R&D to technology delivered on an on-demand, service-driven basis. It's not unique, since this has been happening in almost every other aspect of the business for decades (manufacturing, finances, marketing/advertising, etc. ), but it hasn't completely made it's way into IT. Some of the Cloud/Service Providers are starting to solve this challenge, but often times with groups outside the primary IT organization. The technology vendor (or provider) that figures it out for the primary IT organization (addressing people fears, security fears, SLA fears, leverage internal and external IT services, OPEX/CAPEX balancing, etc.) is going to break away from the pack.